MAJOR GENERAL FREDERICK E. MORRIS JR.
Major General Frederick Eugene Morris Jr., was the director of data automation, Comptroller of the Air Force, Headquarters U.S. Air Force. In this capacity, he was responsible for all data automation matters within the Air Force. He directs, controls, and manages the overall program and serves as the focal point for coordinating data automation matters with non-Air Force agencies. General Morris was born in San Francisco, California, in 1919. He graduated from Humphries School of Business, Stockton, Calif., and received an associate of arts degree from Stockton Junior College, Stockton, Calif., in 1941. He has also taken courses at Georgetown University and at the University of Dayton. In January 1942 he entered military service as an aviation cadet and in July 1942 completed pilot training, received his wings and was commissioned a Second Lieutenant in the Air Corps. During World War II, General Morris served as a combat pilot and unit commander in both the European and Pacific areas. He completed 66 combat missions and was awarded the Distinguished Flying Cross and the Air Medal with seven oak leaf clusters. Since World War II, he has been assigned primarily in the logistics, programming and comptroller fields. In June 1948 he went to Washington, D.C., where he served in programming and budget functions at Headquarters U.S. Air. Force. He remained in Washington until he was reassigned in December 1952 to the Netherlands as air attache. In July 1956 General Morris returned to the United States and was assigned to Headquarters San Antonio Air Materiel Area, Kelly Air Force Base, Texas. He served as assistant for depot maintenance and then as director of maintenance engineering. After completing the course at the Air War College, General Morris went to Washington, D.C., in June 1959 to serve in the Office of the Deputy Chief of Staff, Development. In June 1961 he was transferred to the Organization of the Joint Chiefs of Staff with the Special Assistant for Programs and Budget. In July 1963 General Morris was assigned to Headquarters Air Force Logistics Command as deputy comptroller and in January 1965 was appointed comptroller. He served in this capacity until October 1967, when he was named to head Logistics Command's new Advanced Logistics Systems Center, Wright-Patterson Air Force Base, Ohio. In September 1969 he was the recipient of the Air Force Association's Thomas P. Gerrity Memorial Trophy for his outstanding contributions to systems and logistics management during his tenure as first commander of the center. In August 1969 General Morris returned to Headquarters U.S. Air Force as director of data automation in the Office of the Comptroller of the Air Force. His military decorations include the Legion of Merit with oak leaf cluster, Distinguished Flying Cross, Air Medal with seven oak leaf clusters and Joint Service Commendation Medal. 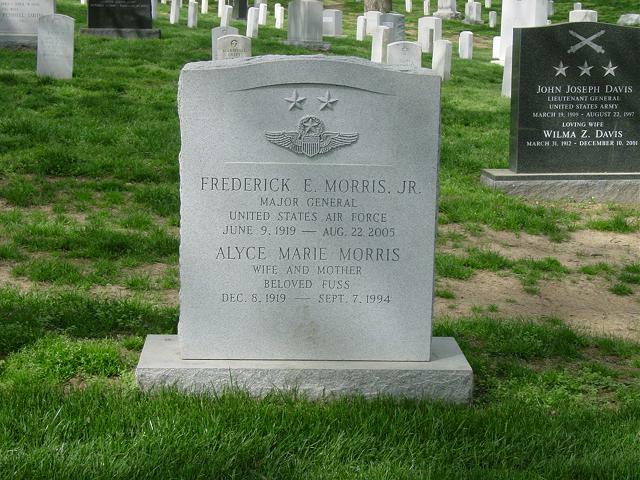 General Morris was laid to rest with full military honors in Arlington National Cemetery on 20 October 2005.